Welcome to one of the first Futoshiki Puzzles sites online! Futoshiki is like sudoku except there is no box constraint. Instead, you have greater than and less than signs indicating the relationship between certain cells in the puzzle. This adds a delicious twist to the massively popular puzzle. The standard futoshiki grid is either 5 x 5, 6 x 6 or 7 x 7 and requires you to place the numbers from 1 - 5 through 1 - 7 in the grid once per row and column and in obeyance with any inequalities shown. In futoshiki there should be one valid solution per puzzle that can be reached through logic and clear thinking alone! We can supply Futoshiki puzzles for publication in print-ready PDF format. Here is a Sample Futoshiki puzzle with solution on page two. Or, if you prefer a physical book of puzzles, then take a look at the Futoshiki Puzzle Book page where you can choose to buy a book of 100 5x5, 6x6 or 7x7 futoshiki puzzles. Here are some futoshiki strategy tips to help you solve the puzzles. The first tip is to remember that you can only place a number once in each row and column - and with Futoshiki X, in each major diagonal. Therefore knock out numbers already placed in the regions that the cell you are trying to solve is in. Remember also to use the essential rule from sudoku that each number must go once in each region - therefore if there is only one cell a 1 for instance can go in, you can place it there. 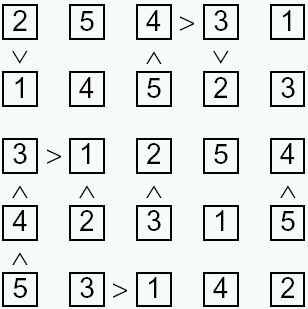 Look especially for places that you can tell is either a '1' or '5' - this can help you start many futoshiki puzzles. Good luck solving the puzzles - remember to have fun! Another variant of futoshiki / hutosiki that you might have seen is Futoshiki Equality. This version of the puzzle also uses the equality relationship in addition to the less than and greater than sign, to show that some cells contain the same values (clearly across diagonals as a number can only be placed once per row and column). Here is a sample Equality Futoshiki - another fun variant of this increasingly popular puzzle! You can play Thousands of Puzzles Online across over twenty different puzzle types. If you want puzzles for print publication, whether futoshiki or one of many other common or unusual puzzles, check our our Puzzle Portfolio.